Hey Everyone! Feels like ages since I last said that! I am so sorry that I have been MIA this past week and a bit. I have been on a lifeguard qualification course and have only just arrived home so I have been super busy and exhausted. I had my assessments today and passed everything except for the timed swims section which involves swimming with a casualty. It's easy to do but extremely hard to swim in the required time. I am extremely disappointed as you need 100% to gain the qualification so technically I failed. However, in 28 days I will be redoing just the timed swims and will gain the qualification should I pass. My local leisure center will be my home for the next month!! But anyway before I ramble on let me tell you about a new addition to my jewelry collection. 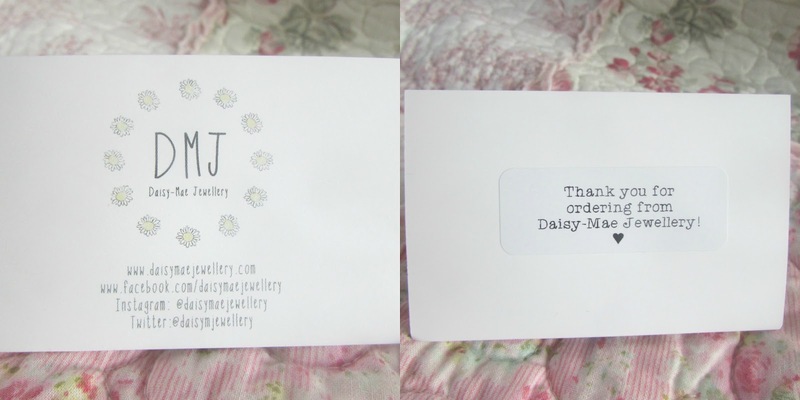 Daisy Mae Jewellery is a UK based business that offers ships all their products to customers worldwide. Her jewelry section varies from anklets, bracelets, charm bracelets, earrings, necklaces and of course rings. From browsing her website you can see that her jewelry has been inspired from things such as Harry Potter, The Hunger Games and Audrey Hepburn. If you click on the link which will be provided at the end of this post you can see that she is selling an Audrey Hepburn necklace, mocking jay pin necklaces and also a Deathly Hallows necklace which are all colored silver. Perfect for all you fanatics out there! 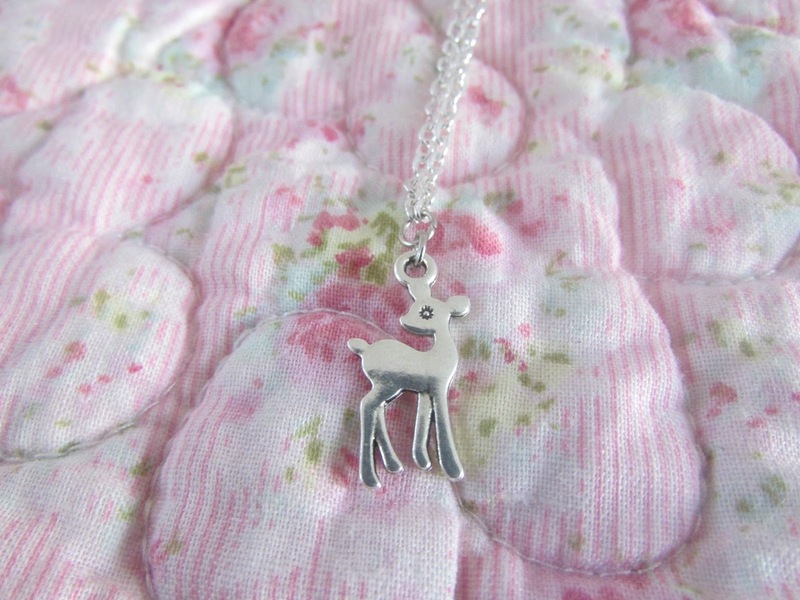 If you are a dedicated viewer of Zoella's youtube then you will know that before Christmas she received an absolutely gorgeous gold fawn necklace from a viewer. It was so incredibly beautiful however I had no idea where it was from. The other day I was browsing instagram and I saw a replica in silver by Daisy Mae Jewellery. I immediately decided to order it and within two days it arrived at my door step and had been sent by first class post. Such excellent service! I absolutely love this necklace. It is so incredibly dainty and beautiful. The fawn is a perfect size, not too big but not too small and the chain is 18 inches long which I think is perfect. I'm not a massive fan of the overly long or choker based necklaces so this is perfect for me. The necklace itself is like I mentioned above colored silver and therefore is not ideal to wear daily or in the shower, which can actually be a problem if like me you forget to take your jewelry off! This is so that none of the silver rubs off! This gorgeous necklace retails for only £4.50. but is unfortunately out of stock on the Daisy Mae Website. 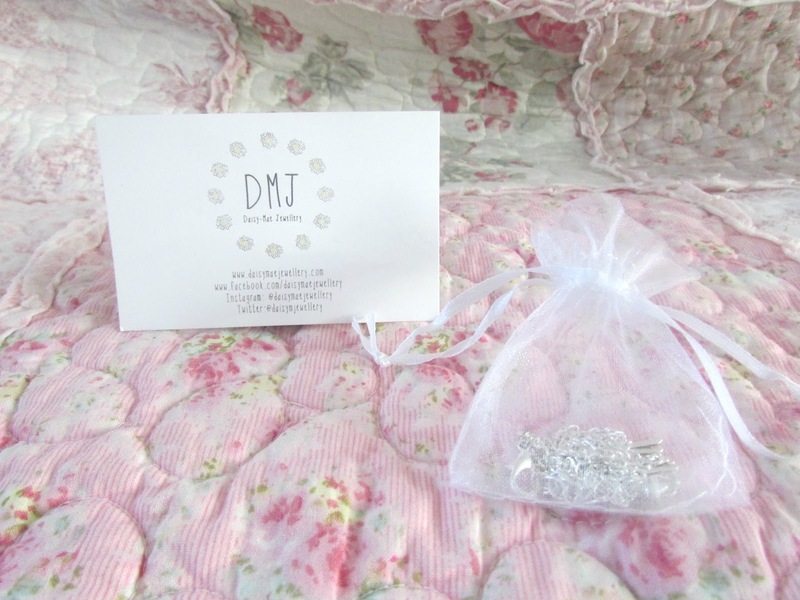 However click HERE to browse the website for more of her other amazing jewellery which is also super affordable ranging between £2.50 and £6.00. Absolute bargains, such good quality and you receive absolutely incredibly customer service. Postage and Packaging range from £1.10 if you live in the UK and £4.00 if you live anywhere else in the world. However if you order more than one item at any one time only the first item will cost you £1.10. Every other item will be 30p after (UK Only). If you are overseas then only the first item will cost £4.00. Ever other item will be 50p. Daisy is the mastermind and only person running this business at the moment. I absolutely love her work and the quality of the products and will definitely be making a few more purchases in the future. Her shipping dates are Mondays and Fridays so make sure to get your orders in before 4PM on Sunday (Monday Delivery) and 4PM on Thursday (Friday Delivery). What are your favorite jewelry pieces to wear? Heya everybody! Hope you are all well and are having a lovely end to the week! Finally the weekend is here. I'm so excited for this weekend, I have my cousin's birthday shindig tomorrow night and then I'm going to see Taylor Swift on Monday! I cannot express how excited I am to see her. Anyway, enough about me. Let's get onto this post. Last month I decided that I would subscribe to the 'Love Me Beauty' box. I won't go into too much detail because I've already spoken about it HERE. 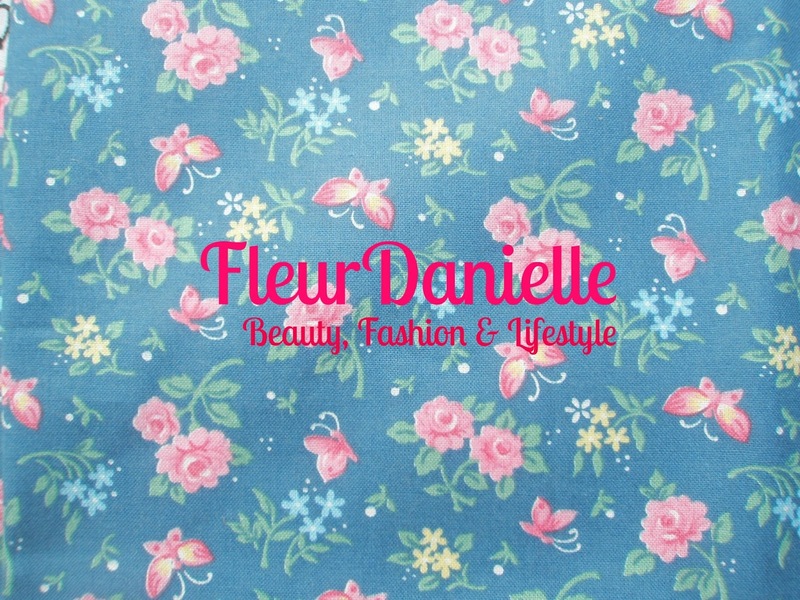 Basically for £12.95 a month including p&p you get 5 products delivered to your door. These range from sample sizes to full sizes which I think is amazing. 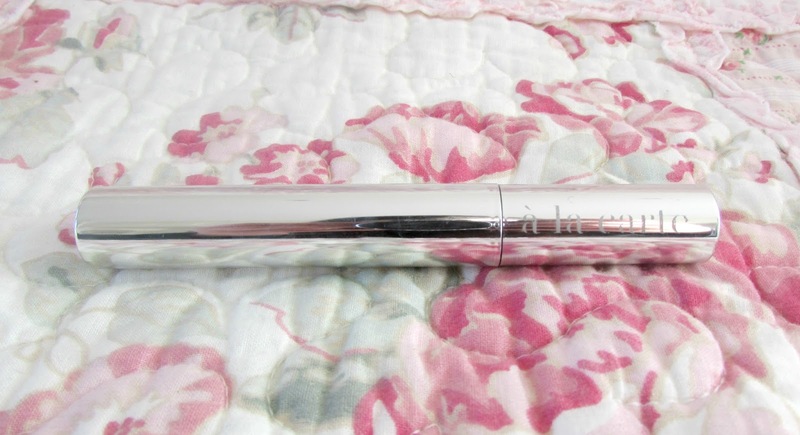 You can probable already tell that one of the products I received in January's Love Me Beauty Box was this Cosmetics A La Carte Divine Lash Mascara. Cosmetics A La Carte is a brand I had never previously heard off so I was extremely excited to try this mascara and I wasn't left disappointed. It is just incredible. Definitely one of the best mascaras I have ever used. Let's just talk about the packaging for a start. How amazing is this? I am a huge fan of the silver packaging. I think it's very YSLesque of the brand even though there is a significant difference in the colour of the packaging. This came at just the right time because I had run out of my beloved Rimmel waterproof rocket volume mascara, so I was super excited to try this. Only thing that put my off is the fact it's not waterproof, but that didn't bother me at all. When I apply this it adds instant length to your lashes which I absolutely love. I also love the fact that it curls the lashes as well as add the length and volume to them. This is definitely due to the slim tapered and flexible brush that allows even the tiniest eyelashes to be given a coat. 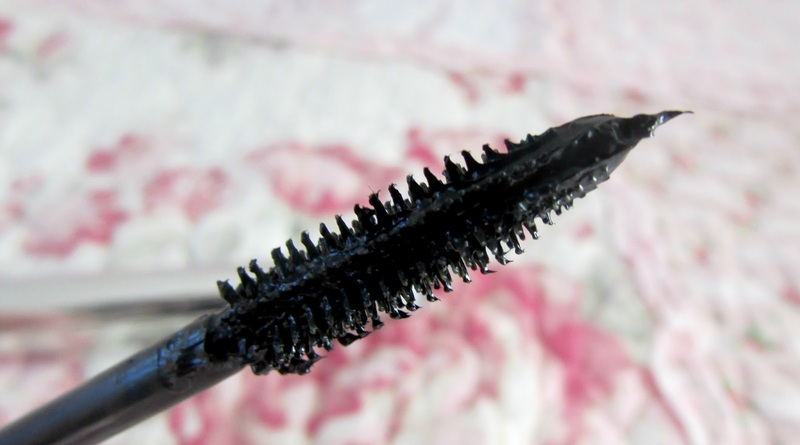 When I first applied it I did notice a few clumps and I felt my heart sink a little bit however the more you run the brush through your lashes these soon disappear. Having tested this out on more than one occasion I can say with full confidence that mascara lasts for such a long time without any need to reapply. It doesn't smudge at all throughout the day. It might smudge a little bit when you first apply it, but I consider that normal, however throughout the day no matter how warm it is it doesn't melt and just keeps that perfect curl that us girls all love. I do think, however, this is definitely more of a nighttime mascara then a day time mascara. 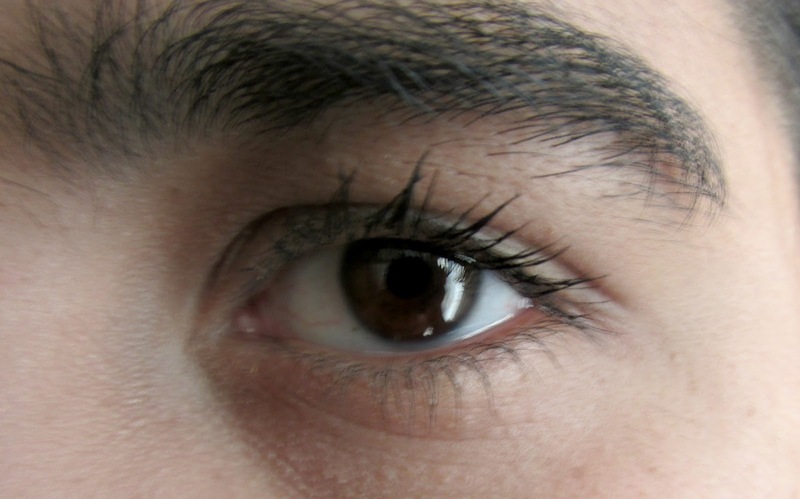 The above photo (I apologize for the little bit of blurriness and horrendously bushy eyebrows) was taken after only one coat of mascara was applied to the top and bottom eyelashes. Amazing right? This mascara is retailed at £23.00 and considering this box is £12.95 including p&p I think that it was pretty incredible deal to receive this in a beauty box. If you have glossy boxes or any other form of beauty box I would suggest subscribing to this beauty box instead as it's just incredible. Head on over HERE to find out more about Love Me Beauty and head HERE to purchase the mascara which comes in a brown shade as well as your standard black (which is what I received). I absolutely love this mascara and I will definitely be trying more things from the brand as I think all their products sound and look amazing. 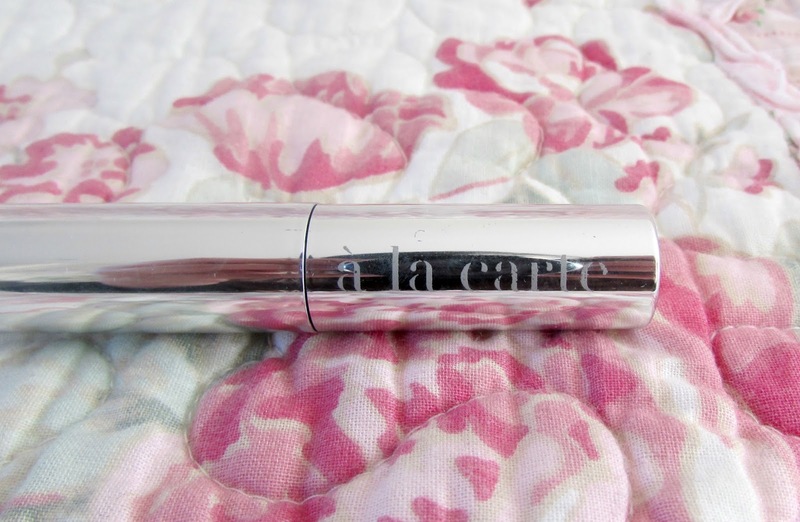 Have you tried this mascara or anything by Cosmetics A La Carte before? Hey Everyone! So today I have posted my very first youtube video. Those of you who read my post yesterday about starting a youtube channel will know that I really want to explore that side of the beauty community and how interested and passionate I am about doing this. However today I have had a bit of a 'Should I, Should I Not'. I had work earlier and came back and just wasn't sure if I should do this or not. 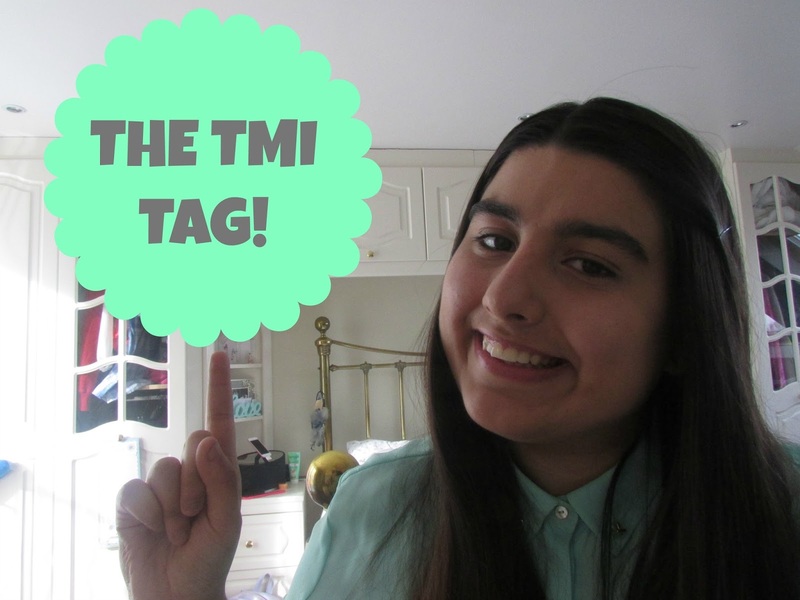 But as you can all see I have finally plucked up the courage and have published my first video over on my channel. I decided that a good first video to do was a What's In My Bag? This is purely because I know they are always highly requested and really popular videos to watch. It's also one of my favorite videos to watch and I thoroughly enjoyed filming it. Those of you who follow my blog will see that it is the same bag I used in my first what's in my bag post uploaded in the summer! (Click HERE to head on over to the post), however I don't tend to purchase bags that often so I am still using the same one and the contents are pretty different. I really hope you enjoy this video and can finally put a face and voice to the person behind all the posts you have read. I am extremely shy and it will take time for my full personality to come out so I hope you forgive me and I expect ANY constructive criticism. If you enjoyed this video then please give it a thumbs up and subscribe! Leave comments below this post or on my video telling me what videos you would like to see next! (No tutorials as I'm not THAT confident just yet) and I will be sure to film them all for you. Hope you all enjoy watching my video and be sure to stay tuned tomorrow for a blog post on one of my favorite mascaras. Talk to you then! Hello Guys! So as promised last week I am back with my Valentines Day Gift Guide for the men in your life. Whether in a relationship and fancy spoiling your boyfriend or maybe your family is like mine and gift each other valentines day presents I'm sure there is something here that will spoil the men in your life. So let's get started. If your man still thinks he is a bit of a superhero and just hasn't managed to grow out of that stage yet or you think he's a bit of a superhero himself then the batman mug will be absolutely perfect. I just absolutely love this mug I think it's so cute and if you have been following me since before Christmas you would have already seen this in my Christmas Male Edition Christmas Gift Guide. The wings are the handles and I just think this is absolutely perfect for men and boys of all ages! Men don't tend to be very organised. We always see them running around the house looking for their keys, wallet and phone and perhaps even their own watch. Again this item was in my Christmas Gift Guide and is a little leather tray where they will be able to store all of their belongings so that it is easy for them to find the next day. It has different compartments that will be big enough for all the important everyday items that they use. For example their very own personalized wallet which as you can see I have also included above. Practical and useful! All men like to smell good! So what better way to spoil him than with a Paco Rabanne 1 Million Eau De Toilette Spray. I chose this particular spray as it is gold. Now you don't tend to see that many gold aftershave for men so I just though, as Valentines Day is afterall, a very special day this would be perfect. Of course his favorite one would obviously go down extremely well too! Personalized gifts always go down well and in particular I've noticed personalized alcohol giftsets really go down a treat. So why not get a whisky glass (even if he doesn't drink whisky) and put a personalized message on it? I think it's the perfect gift to let him know how much he means to you as it's not over the top romantic, it's practical and it's just a really thoughtful and lovely gift. Of course they do wine bottles, and stoppers and other little personalized gifts you can do as well. Another gift idea I reckon would be absolutely perfect for him would be a little mug that he can put coffee/water/or any other beverage he might like. Obviously the one in the photo says best boyfriend but you can get his favorite football team, or band or a simple mug you reckon he might like. For Valentines Day however, I reckon the one in the photo would be absolutely perfect. If your man is technology obsessed and has an iPad, or even a kindle or iPhone then why not treat him to a personalized cover or just any case you think he might like. Maybe he has had his eye on something in the past that you could pick up? Again it's not over the top romantic but it's practical and thoughtful. The final idea that I will share with you, and I personally think this is so incredibly cute is a story or timeline of your relationship so far. I think this would go down better with those of you who are married/engaged/or are in current serious relationships as you can document the time you met to where you are now and it can be so romantic but also a lovely and thoughful gift that demonstrates how important your relationship is. This is definitely something I would do had I been in a serious relationship! So those are just a few ideas I've given you, if those still don't work perhaps you can both go out for a romantic meal somewhere, or go and see a theatre show, or maybe a cinema trip. If you aren't the really over the top romantic types (nothing the matter if you are) then perhaps an experience day like a photoshoot or wine tasting would go down better. Whatever you choose I hope you have the best Valentines Day ever. Those of you who are single, like me can curl up on the sofa with some of our favorite films, maybe have a few friends around and buy a treat from OUR boyfriends Ben and Jerry! Perfect! Do you already know how you are spending Valentines Day this year? Let me know below! So normally this time of the month I would be uploading my monthly favorites post. However, I just really haven't been using any new products throughout January and I don't want to put together a bunch of products just for the sake of a post as I want you all to be able to trust my opinion. So I hope you forgive me for not posting a favorites this month. 2013 was the year of skin care for me. Prior to blogging I always took really good care of my skin but since blogging I have discovered so many new products for both my body and face that have just worked wonders. As you can see from the photos and the title this isn't just facial moisturizers, its body and hands too so I hope you enjoy! One of the moisturizers I feel in love with last year was the Vaseline Spray & Go moisturizer. I just absolutely love this product. I'm normally quite lazy when it comes to moisturizing my body after a shower as I just want to get dry and into some warm clothes. But this product just makes it so incredibly easy. You just spray it all over your body in one go and then just massage it into your skin. It sinks in within literally seconds and is non-greasy which is something I love to see in a moisturizer. I've tried both the cocoa butter and the aloe fresh one which is the one in the photos above and I have to say I definitely prefer the aloe fresh one. I find the cocoa butter one amazing too but the scent is a little too much. My next favorite moisturizer was both a hand and body product and was the Avon Naturals Strawberry and White Chocolate Lotion. 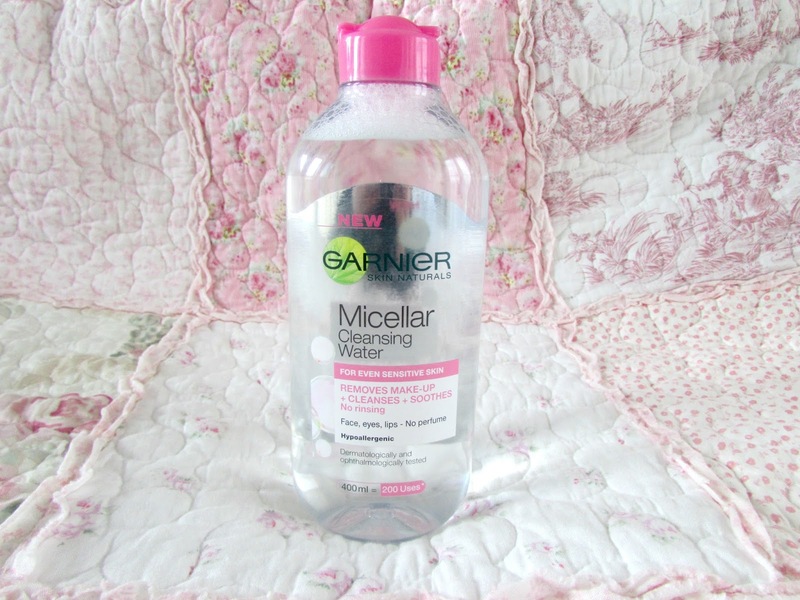 I absolutely love this product as it smells incredible and again is non greasy. However, this product takes a little bit longer to sink into the skin but I can forgive that because it makes my skin smell absolutely incredible and leaves it feeling incredibly hydrated and soft. I also love that I can use this as a hand cream as well as my body. 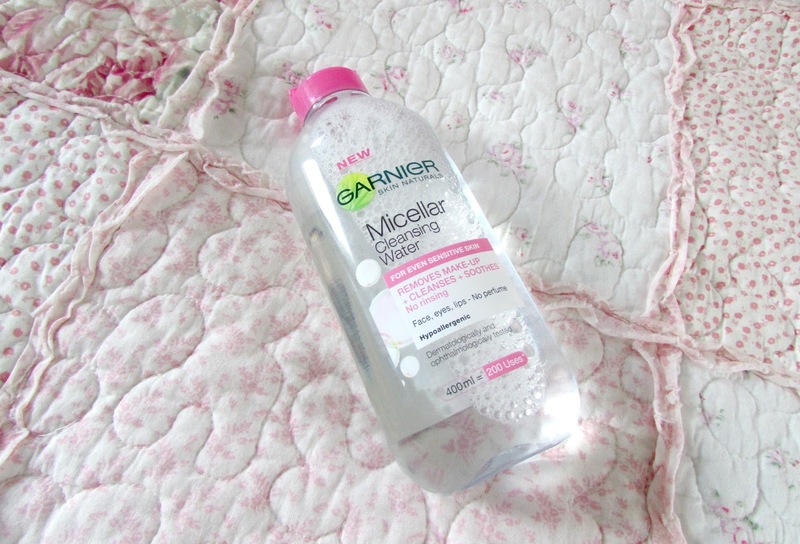 I just love multi-use products like this! The next product is the Garnier Intensive 7 Days Hand Cream which contains mango oil. I just absolutely love this product. It's always in my bag and it just leaves my hands feeling so soft and hydrated. Again when it comes to my hands I am a little bit lazy but the amazing thing about this product is that it keeps the moisture locked into your hands for up to seven days before you need to apply more on. It's amazing. I love it. It has a lovely fruity scent to it as well because of the mango oil. Now you all know how I feel about mango scented products so the mango body butter from The Body Shop was just something I had to include in this post. It smells incredible, it sinks into the skin so quickly and easier, doesn't leave any greasy residue and is just an incredible product. I think I currently have about three big tubs and two small ones. Definitely my favorite scent from The Body Shop. If they discontinue it like the did with the lemon range I will literally go into mourning. Before last year I was never really a big soap and glory fan. The only products I used from the range was the hand food. However, under the influence of reading blogs I just had to go and try some of their moisturizers and I absolutely love them. 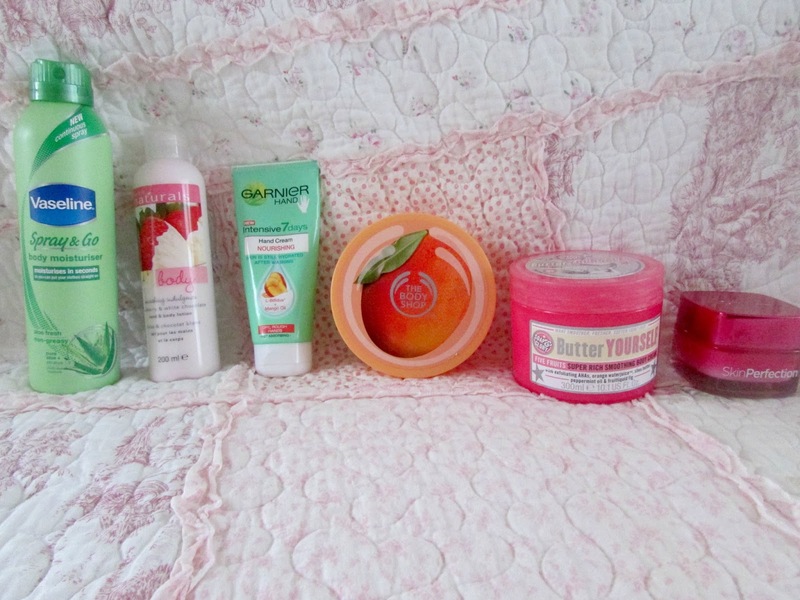 My favorite one is probably the 'Butter Yourself' moisturizer which contains five fruits. This has a very distinctive scent which I don't think many people will like. It took me a while to warm to it but it has one of those scents that can be used all year around. Whereas I think the sugar crush one is more a summer scent and the smoothie star is a autumn/winter scent. But again this moisturizer just sinks into the skin quickly, really keeps the skin hydrated, no residue is left behind and my skin stays soft and supple for hours. The last moisturizer that I have absolutely been loving is then L'Oreal Skin Perfection Correcting Day Moisturizer. That is actually such a mouthful for a product but I absolutely love this moisturizer. I think it's a perfect base for make up, really changes the texture of my skin from being rough in patches to incredibly soft and smooth and I also love the fact that it reduces the appearance of my pores. I also think it evens out my complexion a lot and my make up just glides so easily over the top. 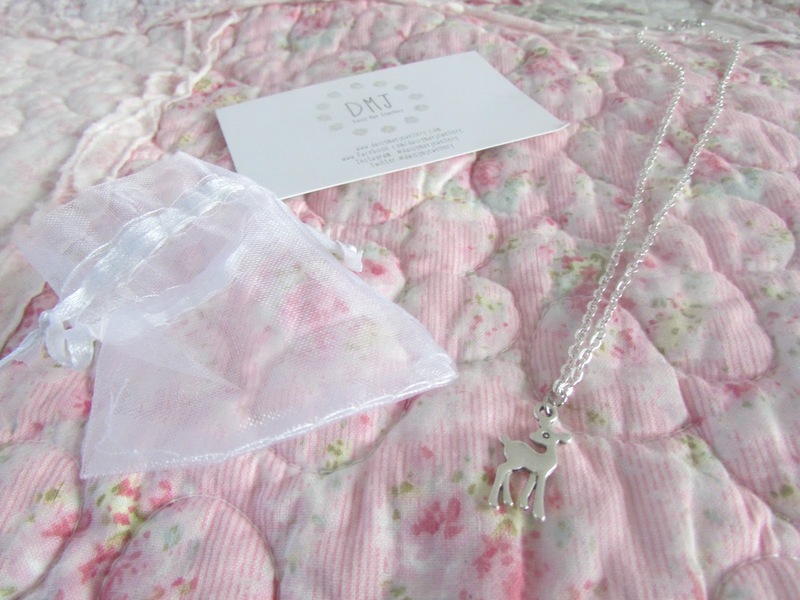 The packaging is also so gorgeous and girly. If you're looking for a good day moisturizer and a base for your make up this is definitely the product to go for. So there are my favorite moisturizers. 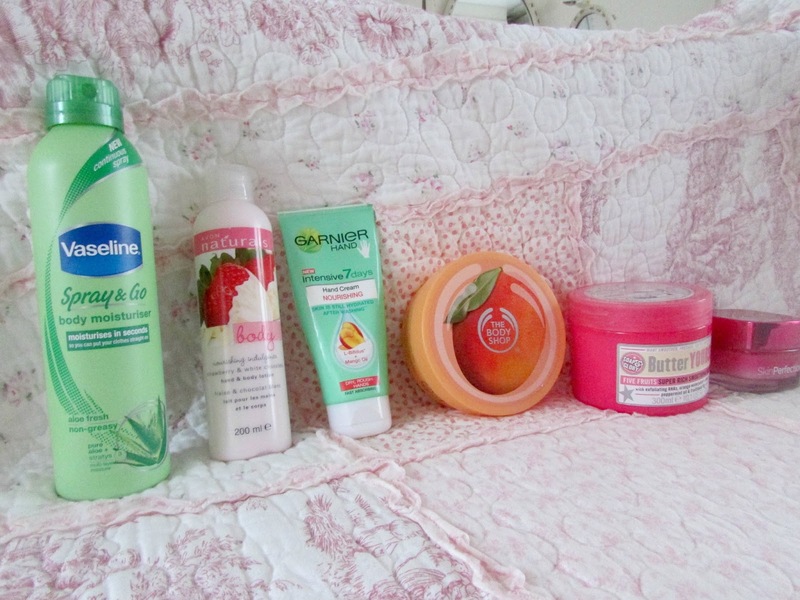 All of these products can be purchased at Superdrug/Boots. I think Boots is the best place to go, though if you want the Soap and Glory moisturizers and Superdrug don't stock that brand. All of these products are less than £12 each. So what are you waiting for? Head on over to the Boots website HERE to have a browse.